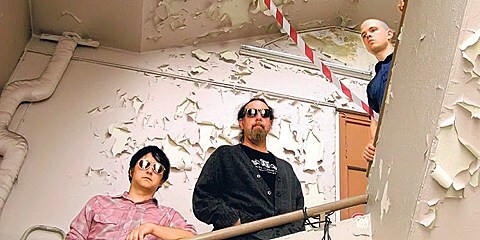 Rangda, the trio of Six Organs of Admittance main man Ben Chasny, Sun City Girls’ Sir Richard Bishop, and drummer Chris Corsano (who’s worked with Bjork, Kim Gordon, Thurston Moore and others), have so far released two albums on Drag City — 2010’s False Flag and 2012’s Formerly Extinct — and they’re now working on LP #3, though there aren’t many details on that. We do know, however, that like they did in 2012, they’ll play two shows this weekend before holing up in Black Dirt Studio to record the new LP. The first of those happens in NYC TONIGHT (1/9) at Baby’s All Right with support from Samara Lubelski (who was in Thurston Moore’s band Chelsea Light Moving) performing as a duo with Zaimph’s Marcia Bassett. Tickets are on sale now. That’s the early show at Baby’s (7 PM start) happening before the Hailu Mergia show at 9:30. Then on Saturday (1/10), Rangda do it again in Florence, MA with Tarp and Moonfed (members of Black Sky). Later this year, Six Organs of Admittance will go on their own tour in support of their new album Hexadic (due 2/17 via Drag City), hitting NYC on April 30 at Baby’s All Right. Tickets for that show are still available.